Asthiposhak - a medicine for the treatment of osteoporosis and brittle bones. This medicine is a source of easily digestible calcium and can also be used for calcium deficiency, including during pregnancy and lactation. 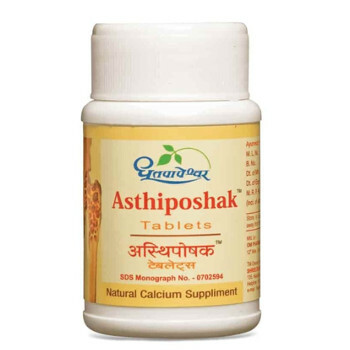 Additionally, Asthiposhak has an anti-inflammatory effect and is used for osteoarthritis. This medicine also reduces hair loss. Indications: osteoporosis, fragility of bones, fractures, osteoarthritis, calcium deficiency. Content: Kukkutandatvak bhasma, Asthisamhruta, Arjuna, Shuddha Laksha, Amalak, Ashwagandha, Guduchi, Shuddha Guggul, Bala, Babboola Kwath. Dosage: 2 tablets 2-3 times a day or as directed by a doctor.